At LinkedIn For Business we provide professional company & showcase pages that build your brand. It goes without saying that your company and all of its employees should optimize their LinkedIn profiles. After all, an optimized profile can boost the visibility of your company and its content in the search results—both on and off the network. That’s because search engines like Google scour pages and URLs for keywords, and LinkedIn profiles offer many opportunities to embed keywords, such as within the LinkedIn URL, other URLs you list within your profile, job titles and descriptions, and content links you include. So if your company and its employees have optimized their profiles, you could very well gain an advantage when prospective customers are searching for companies, products and services like yours. QUESTION: Why Should I Create a LinkedIn Company Page? A LinkedIn Company Page helps others learn about your business, brand, products and services, and job opportunities. We Create Professional LinkedIn showcase pages. * Showcase Pages – Built to highlight the latest updates from brands, business units, and company initiatives. **Showcase pages can be promoted via social media, email and advertising. Make your business more human. When your leaders and people throughout the organization are on LinkedIn, they increase the authenticity, transparency and humanity of your organization. People want to work with and buy from other human beings. Express thought leadership. LinkedIn is one of the best places to share thought-leadership content. Why? Because there are 400+ million sets of eyes to potentially view and share the content. It’s the ideal place for sharing professional ideas and demonstrating your company’s expertise. Make your company a more attractive employer. Today’s employees prefer to work in a socially savvy organization, and they use the web to determine social-savvy levels. According to Spherion Staffing, 47 percent of Millennials now say a prospective employer’s online reputation matters as much as the job it offers. And a study from Altimeter showed that 76% of executives say they would rather work for a social CEO. Make your people talent magnets. One of the first places professionals go when they are looking for a job is LinkedIn. When your people are using LinkedIn regularly, they become visible to those who are seeking employment, attracting talent to your company. Contact JoAnne Funch for details. Follow LinkedIn For Business’s Showcase Page. 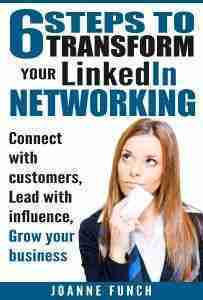 I offer LinkedIn Company Training Workshops that can get you started strong. Want to learn what company and showcase pages can do for your company? So how does this sum up? : If you don’t have one yet, build your own LinkedIn company page for your business now!